I have seen these made with graham cracker crusts but I had a package of Oreo's so I used them as my base instead. You could definitely use graham crackers if you want. Now wouldn't they make a special treat for your Valentine? You don't even have to bake them, but you do have to chill them so give yourself a little time. Another great feature of these bites is that you can make them ahead of time and leave them in the freezer until ready and then dip them in chocolate. OK, maybe you don't like the idea of taking time to dip each one, no problem. Pour the chocolate over the top and then cut them into squares. Simple right? If you do add the chocolate on top and then leave it in the freezer, thaw it in the refrigerator; if it goes straight from the freezer to room temperature, condensation will form and alter the appearance and texture. I actually made a pan and dipped on half of it. The other half I wrapped up and will save for another special occasion. In a food processor, add Oreos and whip until finely chopped and mixed. Transfer the Oreo mixture into prepared baking dish. Press the mixture down using the bottom of a measuring cup or glass to create an even layer. Freeze for 15 minutes. Spread the cream cheese mixture evenly on top of the chilled graham cracker crust. Freeze for at least two hours or longer. 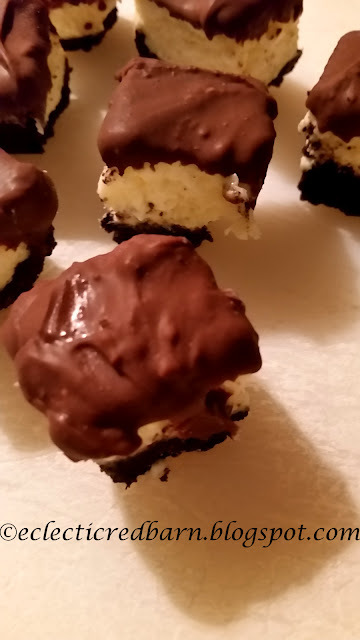 The post No Bake Oreo Cheesecake Bites first appeared on Eclectic Red Barn. 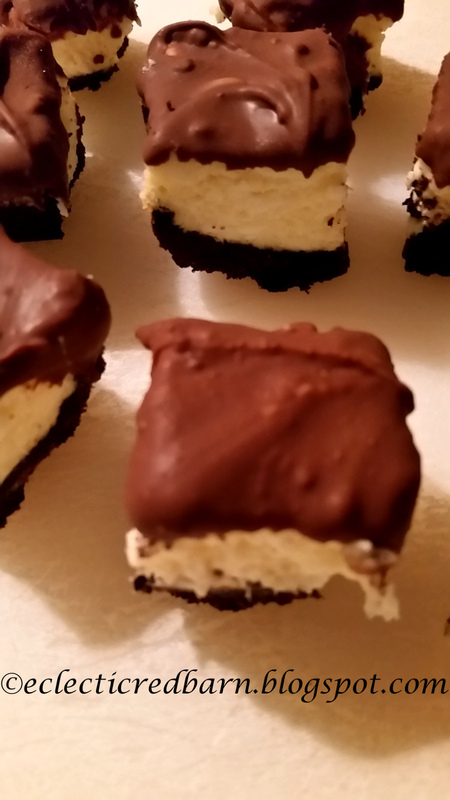 Mmmmh, these mini cheesecakes sound so yummy, and so easy to make! They were so easy to make. The only part that took some time was dipping each one into chocolate, but as I said, you could just spread it over the top and be done. These look delicious! Thank you for sharing on Homestyle Gathering, Bev! 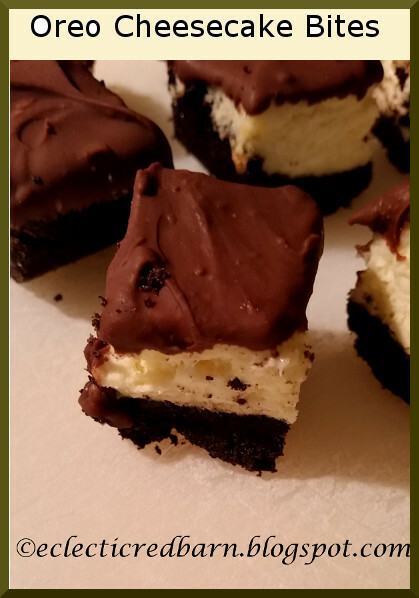 Thanks for the lovely comment on my No Bake Oreo Cheesecake Bites. This looks so good, Bev, and it is definitely my kind of recipe!! Thanks again for visiting and for your kind and encouraging comment on my post about my health issues!! You can't go wrong with no bake. I still have some in the freezer to have later. I like those kind of desserts. Hope you have a wonderful week.